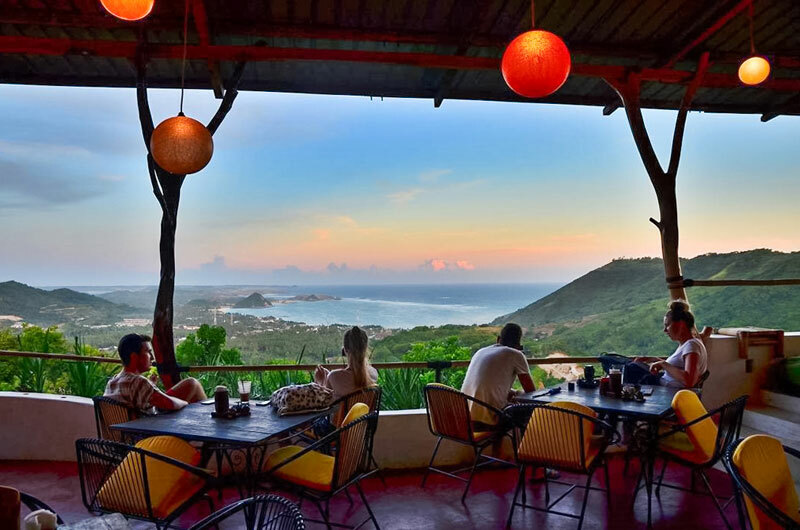 With its white sand beaches, sloping mountains and lush green forests, it’s no surprise that Lombok is popular amongst surfers, adventurous travellers and simply anyone who wants to escape from touristy Bali. 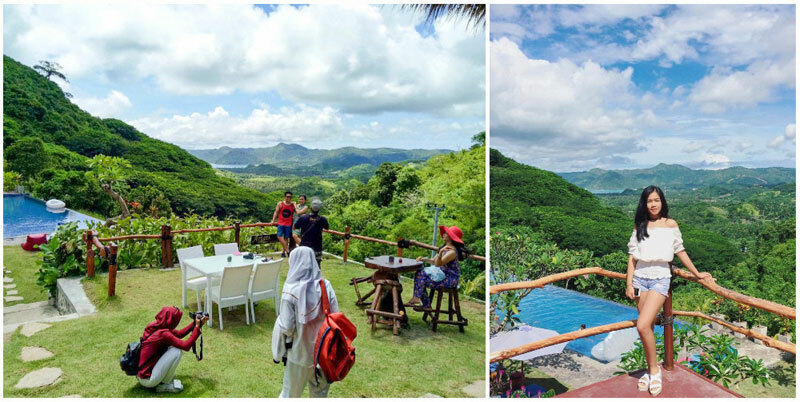 But these restaurants don’t just stop at great food – they also have beautiful scenic views that will leave you absolutely speechless. 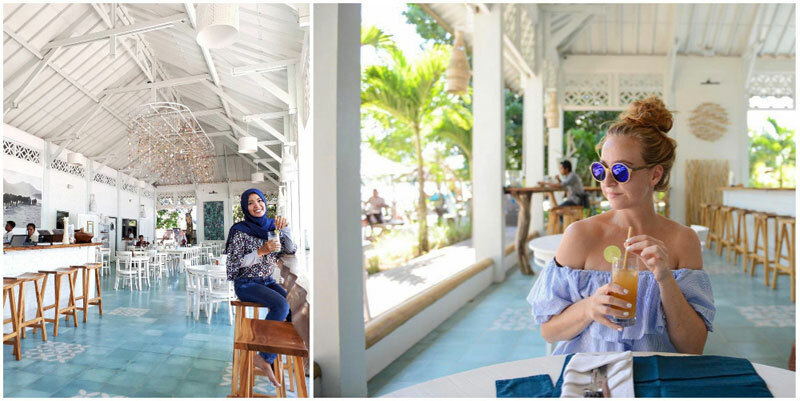 If you are looking for a place to enjoy a casual midday lunch, a romantic dinner for two, or sunset cocktails at the beach during your Lombok holiday, check out these 11 hotspots for a great view with your meal! Breakfast is the most important meal of the day! Start your day right with homemade granola, fresh fruit salad and delicious fruit juice (or lassi, if you want something a little sweeter). 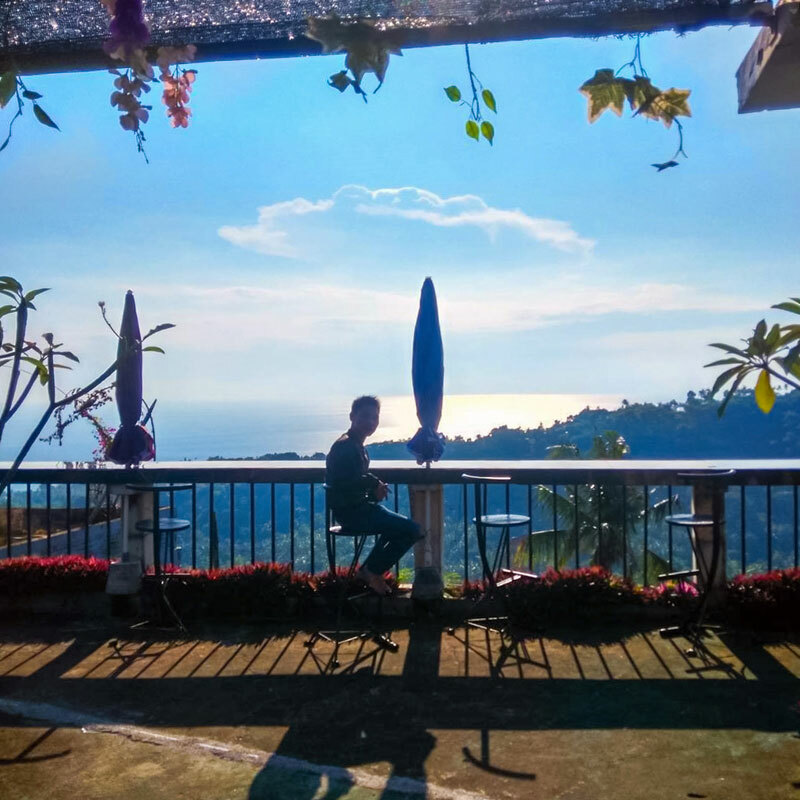 What better way to start your day than with an energizing hilltop breakfast as the sun rises? The menu at Ashtari Lounge ranges from curries and pasta, to vegetarian options, to everything in between – so you’ll never have a shortage of options here! If you’ve got a sweet tooth (and who doesn’t? ), the dark chocolate cake with coconut cream is sinfully decadent. Feel like doing a little cooking yourself? Try the “sweet and spicy” cooking class! You’ll get to pick fresh herbs from the restaurant’s own garden and use them in your dishes. 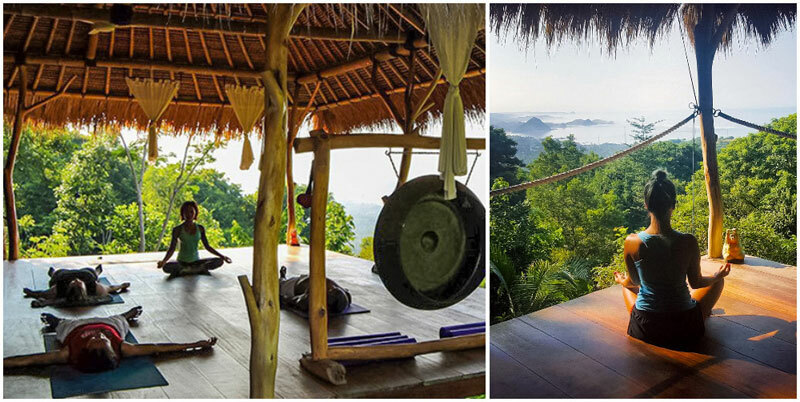 There are also 5 daily yoga classes, running throughout the day from 7am to 6pm, if you feel like squeezing a little bit of zen into your day! 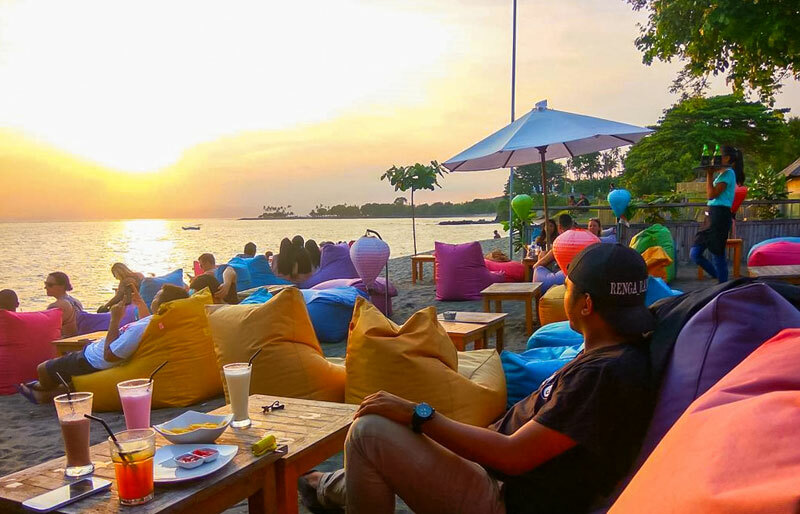 And as the sun goes down, plop down in comfy beanbags, or at the cosy little tables, and soak up the sunset with a cocktail in hand. 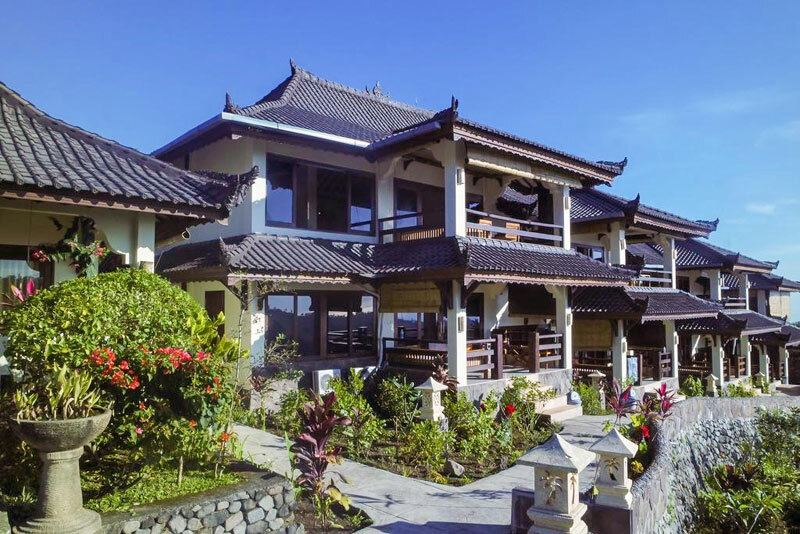 You’ll find a good variety of villas on Batur Layar Hill. 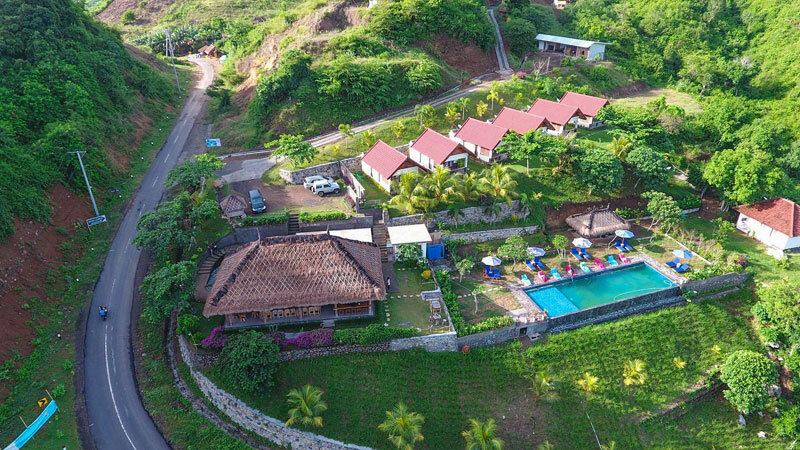 But not all villas are created equal. 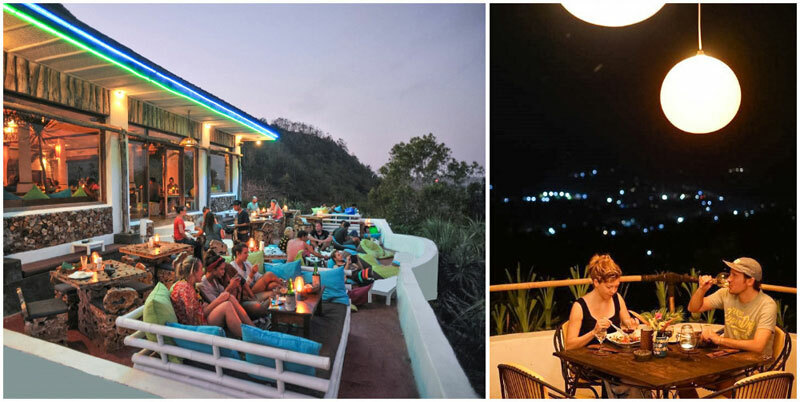 At the top of the hill, you’ll find Villa Libra, which has its own cafe. 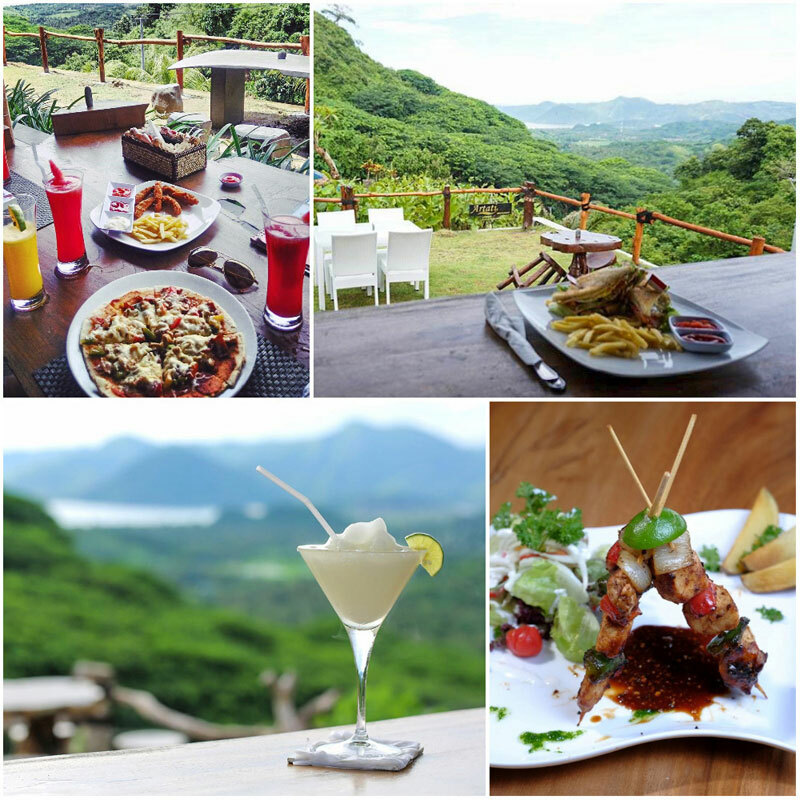 The trek to the top of the hill is definitely worth it for both the culinary experience and the view that awaits you. 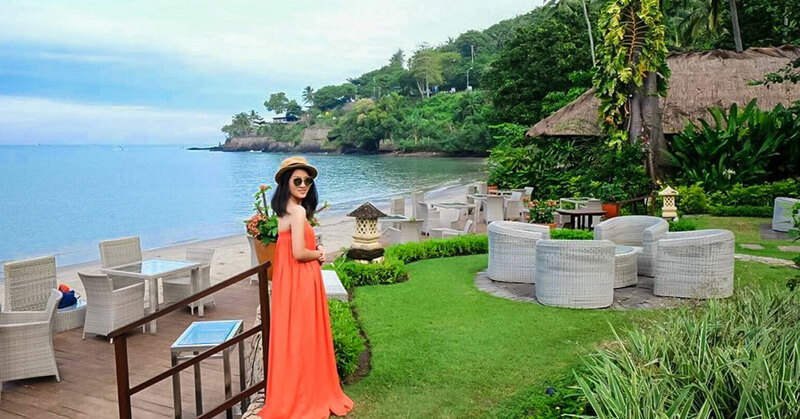 Spread out below are lush green trees and the white sand of Senggigi beach – everything that a hungry and tired traveller needs in a view! Are you a meat lover? Don’t miss the Bakso Bernak (a meatball bowl), and if you dare, order the extra spicy Chicken Wing Kamikaze. The romantic bridge over the pool is an amazing place to take a picture – with the tree canopies and orange skies at dusk, you can’t ask for a better natural backdrop! 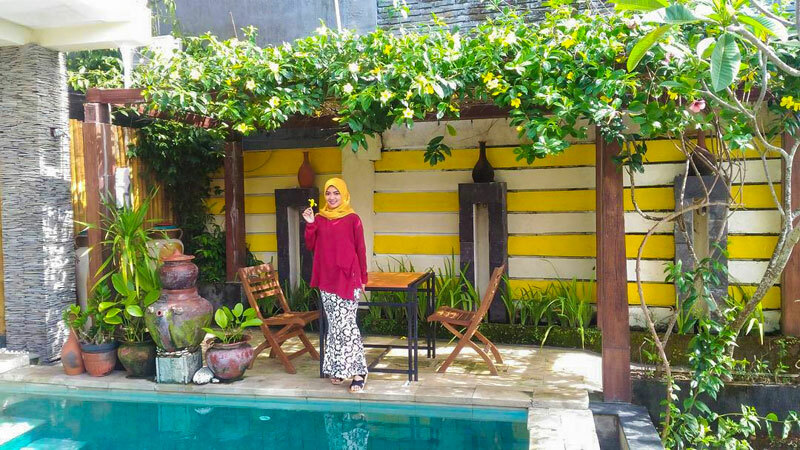 Looking for a real secret hideaway or a hidden gem? 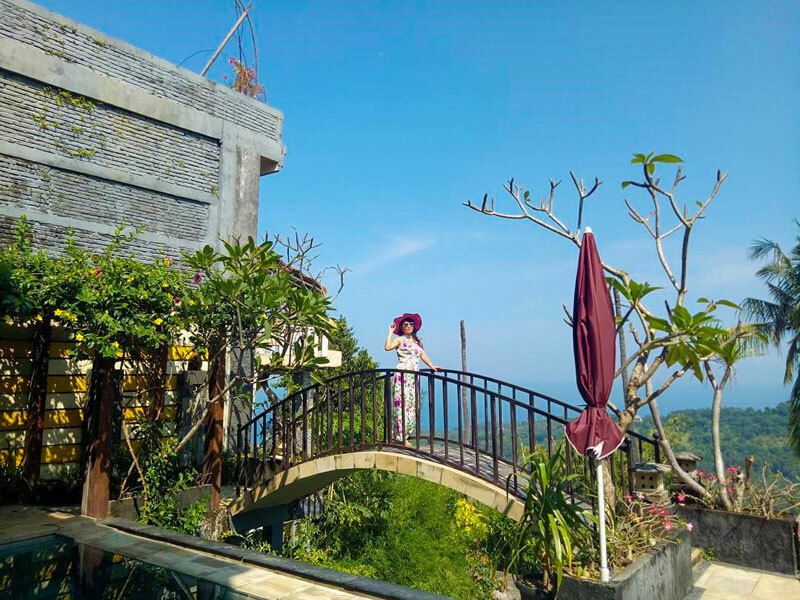 Artati Lombok Bungalow and Restaurant offers a quiet and relaxing dinner experience paired with a beautiful view and friendly service. 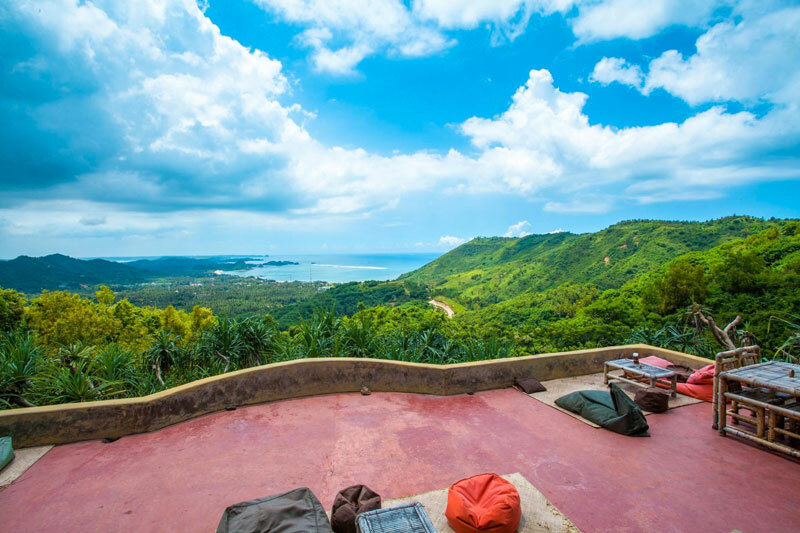 Nestled amongst emerald green hills and overlooking Selong Belanak Bay (a famous spot for surfing enthusiasts), this culinary paradise is only an hour’s drive from Mataram City. 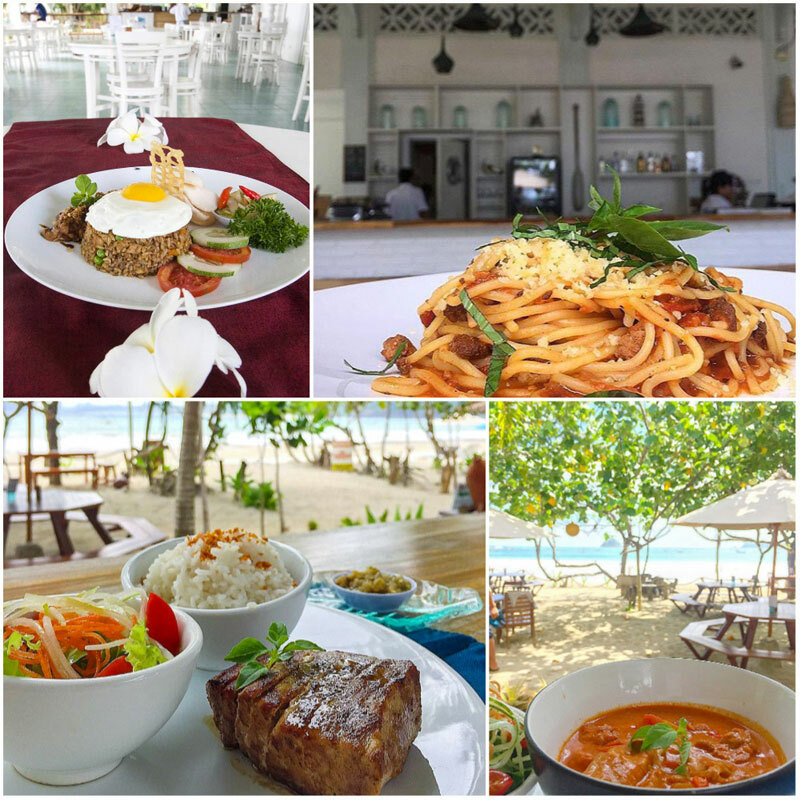 A wide selection of meal options means there’s something for everyone at Artati; not only Indonesian dishes but Western meals are also offered on the menu. Endless options and maximum affordability if you happen to be on a budget! 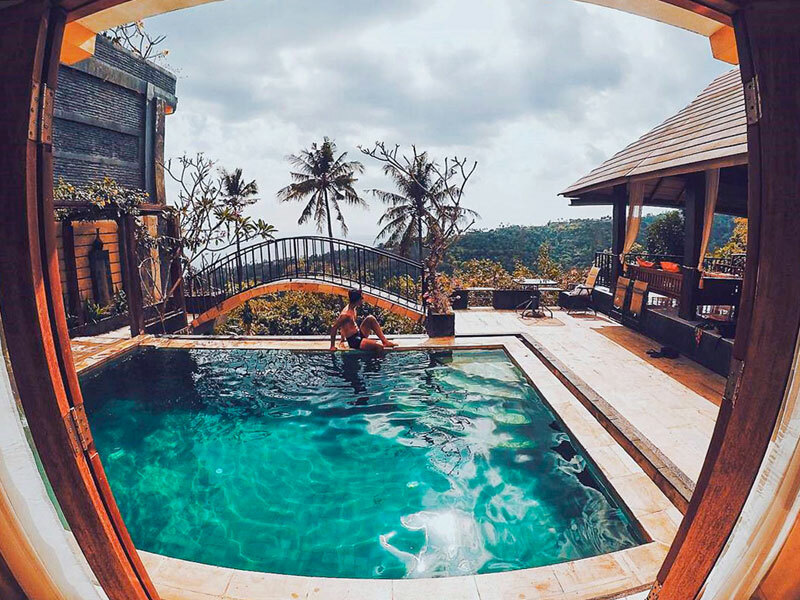 Don’t want to leave? We wouldn’t blame you! 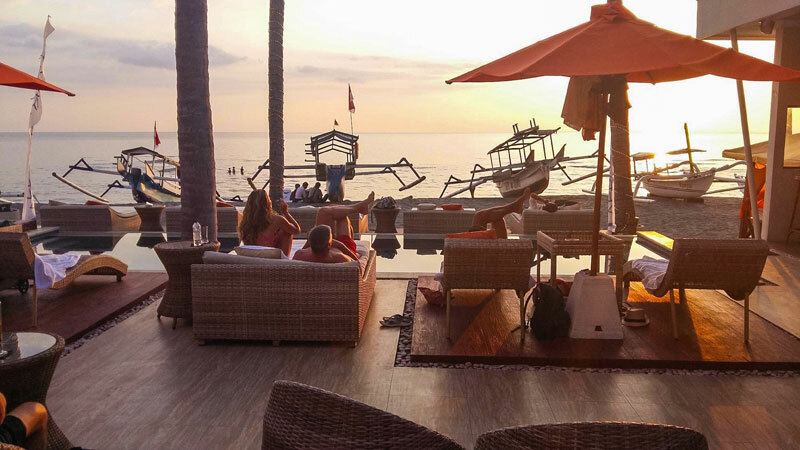 You can spend a night in the bungalow and take advantage of the sunset before you head to bed, and before waking up to the dawn rising over the sea in the morning. 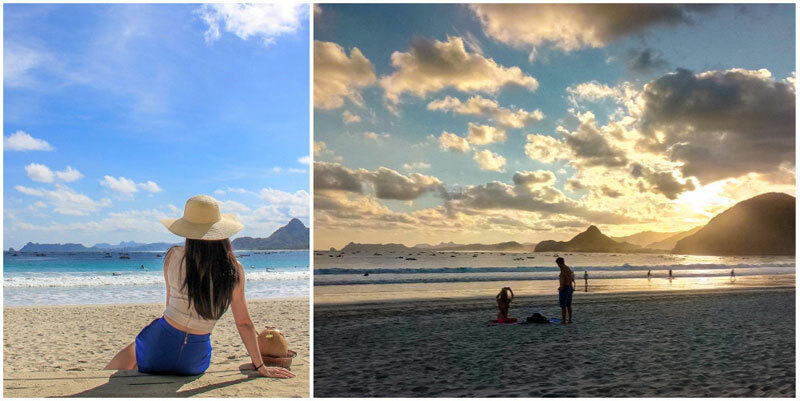 Pick your view! 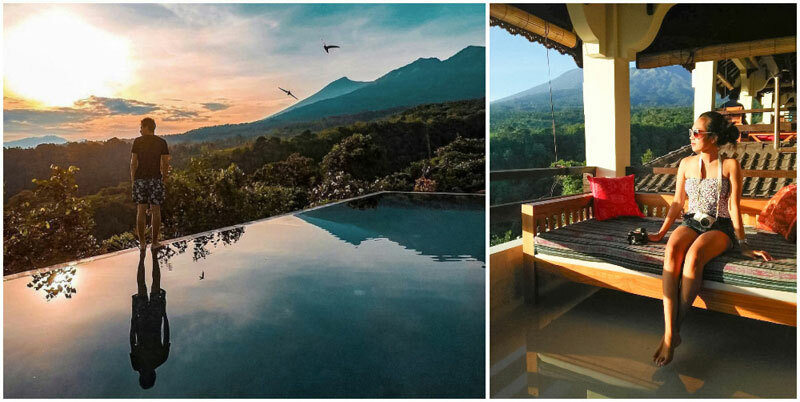 Would you rather dine with the view of the towering Rinjani volcano, or by the infinity swimming pool overlooking the ocean? Your choices don’t end there. 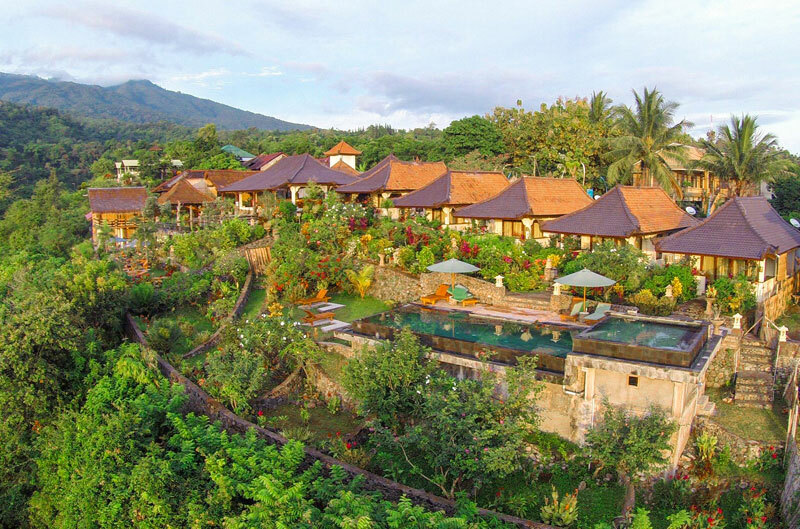 Rinjani Lodge also boasts of a diverse and tempting menu offering both Indonesian and Western cuisine. All of their dishes are halal and MSG-free (not to mention absolutely delicious!). The food isn’t the only thing that’s good here – if you’re thirsty, try a delicious fresh fruit juice. 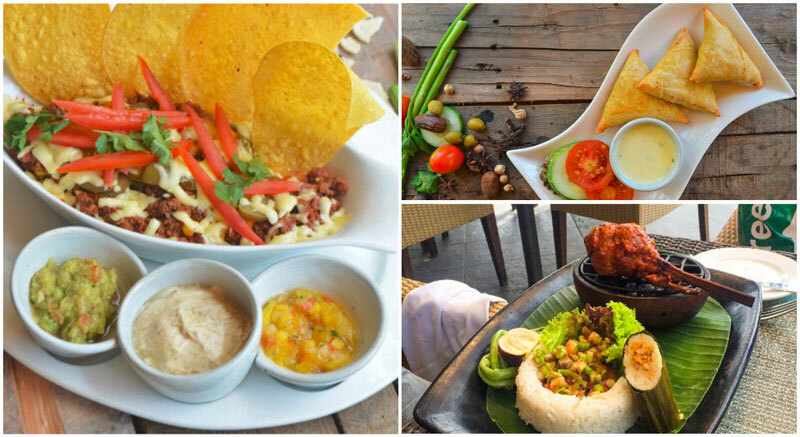 They say that a true culinary experience begins with your eyes – it’s all in the visual presentation! 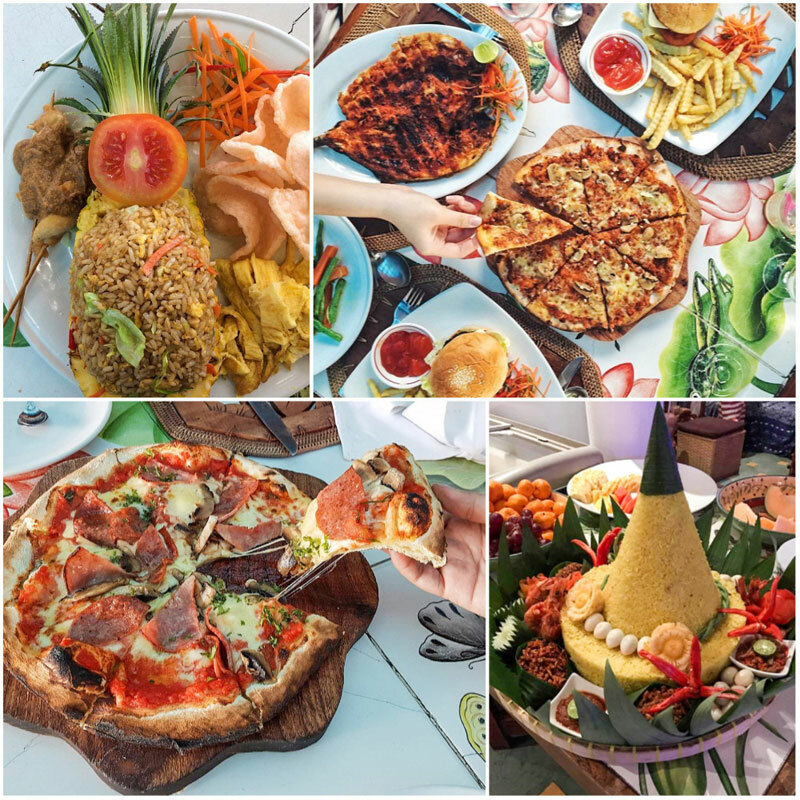 Rice wrapped in a banana leaf, chicken satay stacked high like a teepee, and many other creative presentation ideas give traditional Indonesian cuisine a fun and unique twist. Don’t forget to bring your camera! 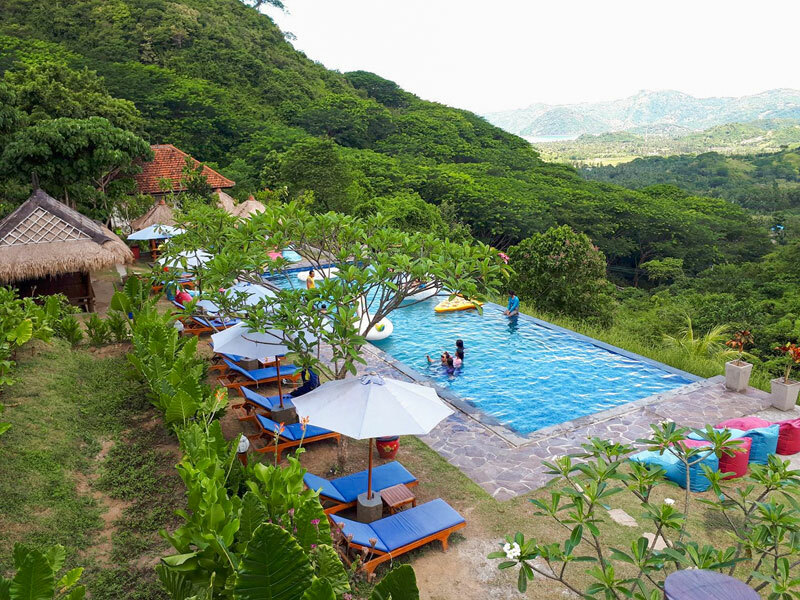 This is the ideal place to fuel up after a day of adventure in Gunung Rinjani National Park, or after an afternoon of splashing and swimming at the Sendang Gile waterfall. 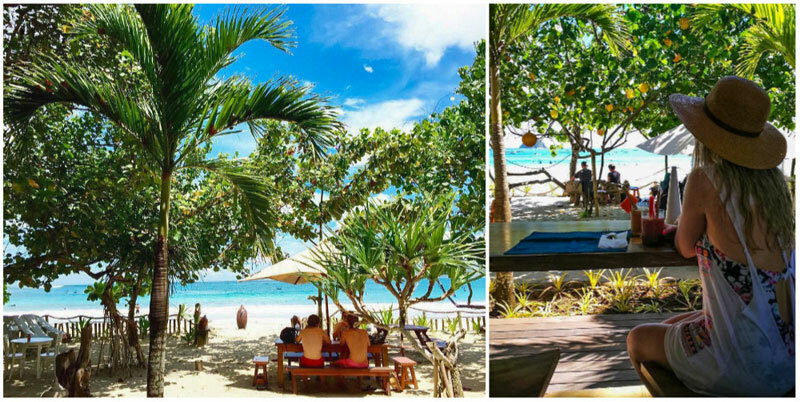 If you’re hesitant to leave, you don’t have to! 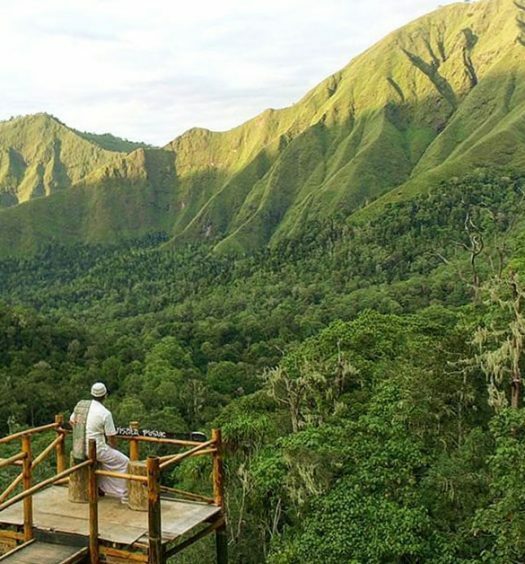 Rinjani Lodge offers the comfiest rooms to see you through the night peacefully. 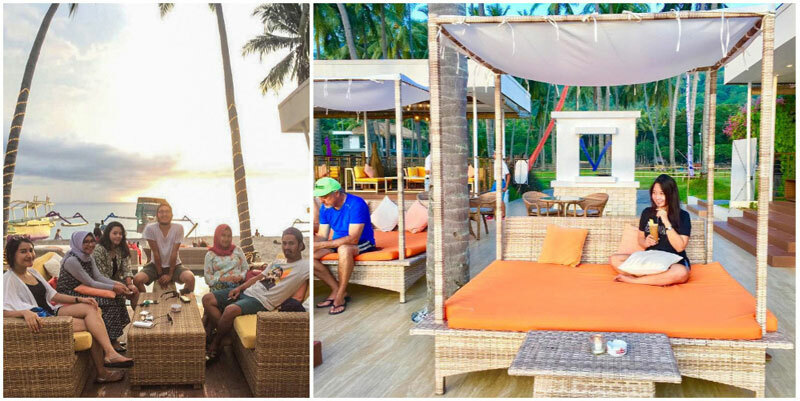 If you’re a fan of the Sheraton Hotels, this oceanfront bar definitely won’t disappoint (how could it? 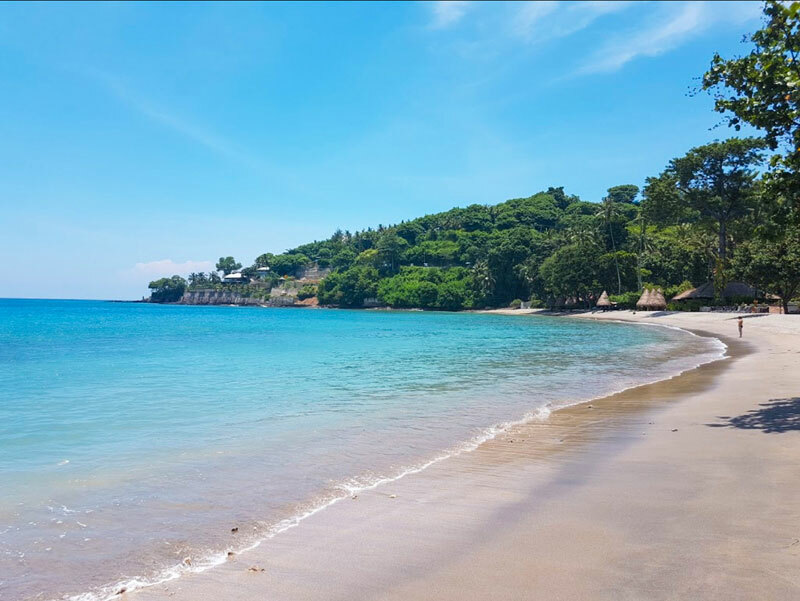 The beach is right here!). 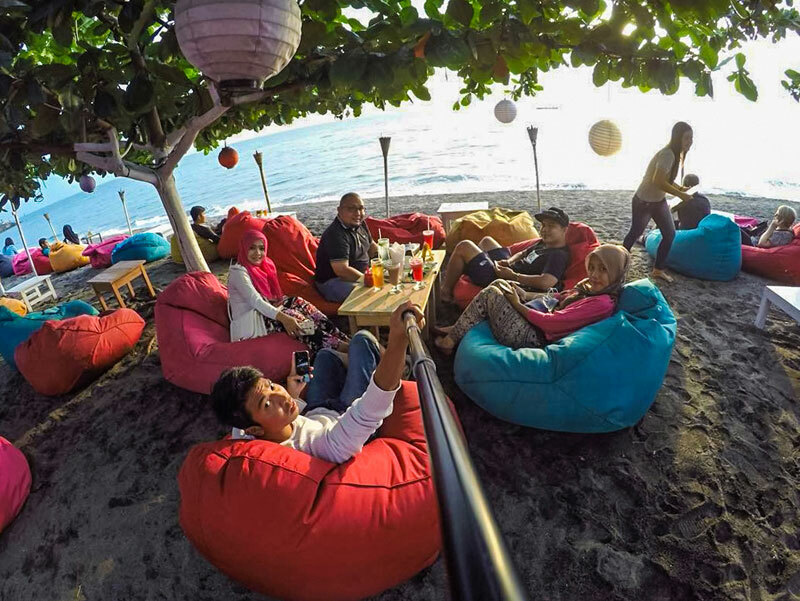 Tables and comfy chairs are set up right at Senggigi beach, near enough for you to hear the gentle rushing of the waves and breathe in the fresh, salty ocean air as you dine by the stunning blue ocean. Live music is also provided – a perfect backdrop to any kind of evening! 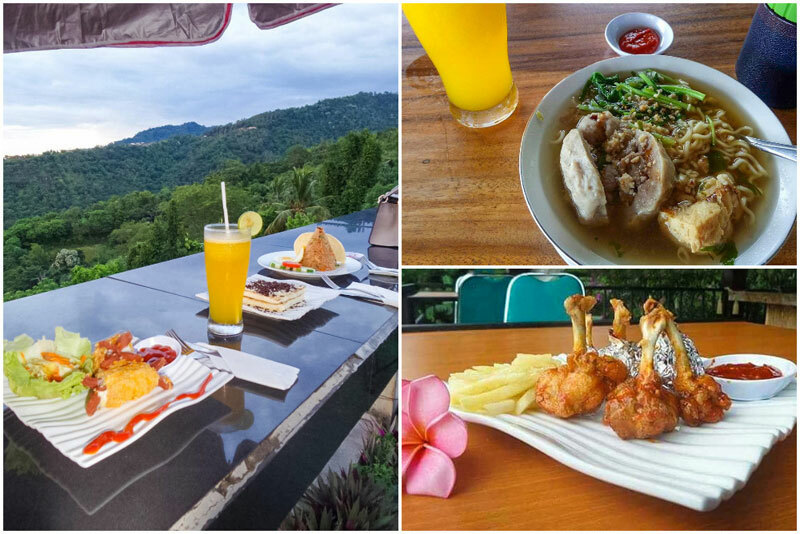 A wide variety of food is available here, from snacks to meals – chicken taliwang, chicken soup, or bar snacks (to go along with your cocktail, of course!) are a great addition to the evening. SENJA doesn’t end at food and drinks. 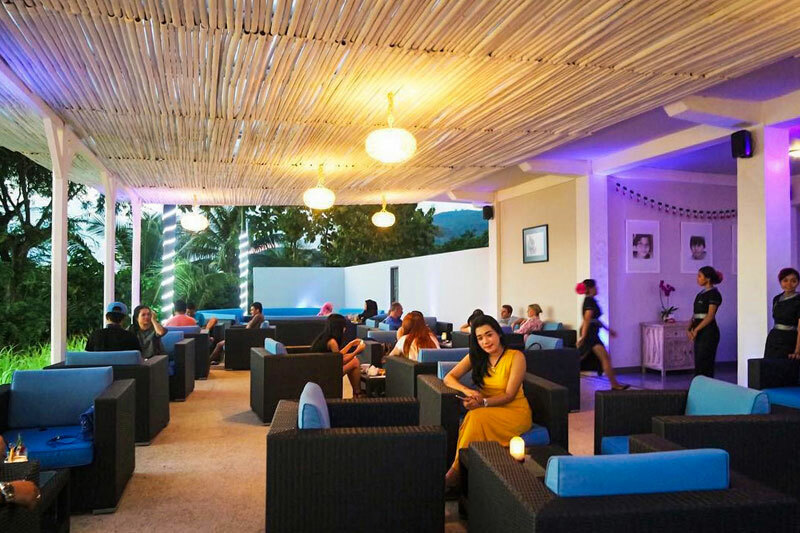 You can also experience both local and imported cigars, a variety of shisha flavours and an exquisite selection of wines. 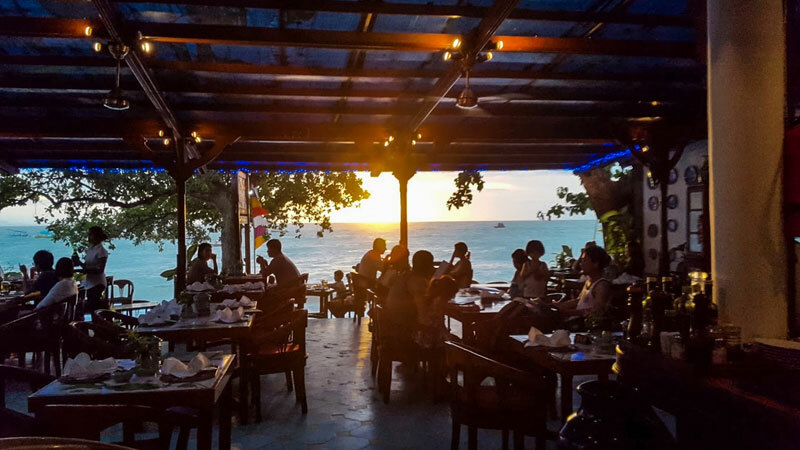 So whether you’re here for a romantic candlelight dinner with your love, or with friends, there’s no better place where you can watch the sun go down! 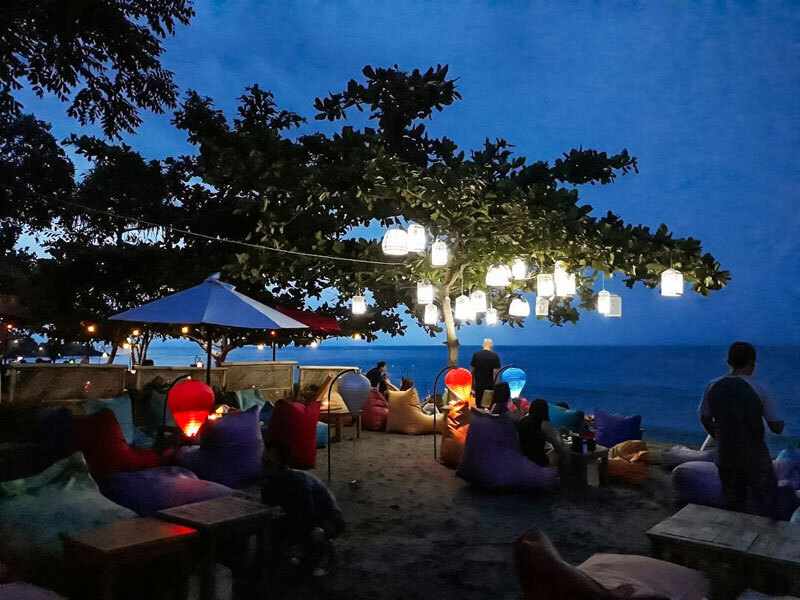 You can’t top the Laut Biru Bar for location! 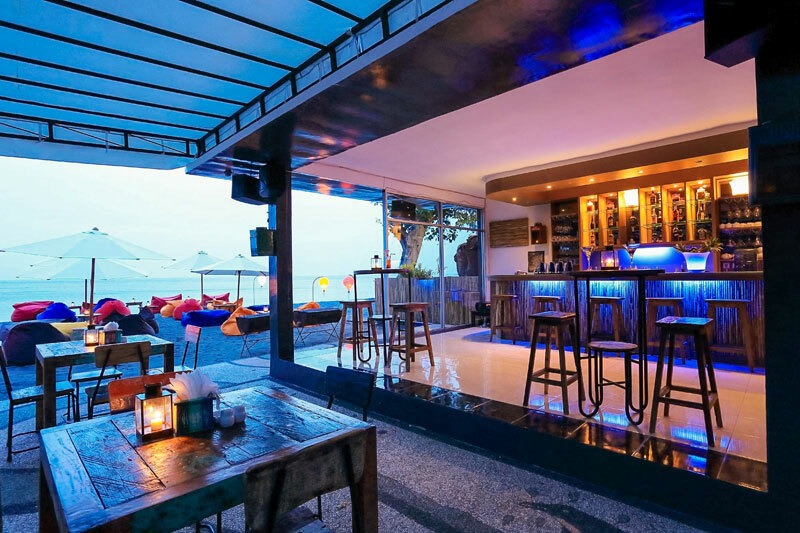 This great bar sits directly on Selong Belanak beach and its beautiful blue and white decor perfectly compliments this popular Lombok shore. The menu is diverse, ranging from classic Western dishes (who doesn’t like spaghetti?) 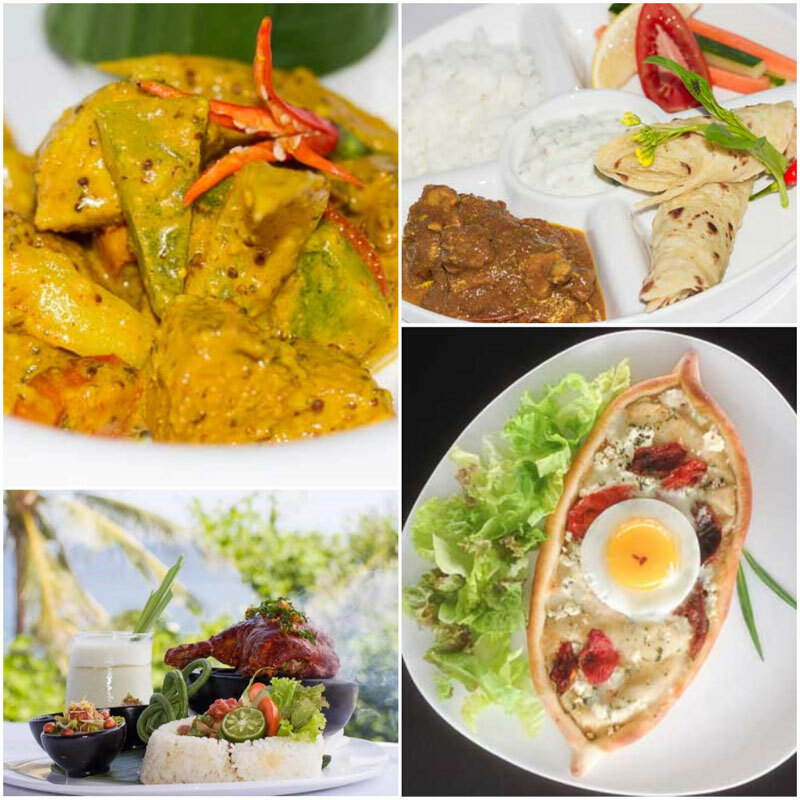 to Indian curry and national dishes like beef rendang or chicken pelalah (a typical Sasak tribe dish). Seafood lovers also have a lot to choose from! 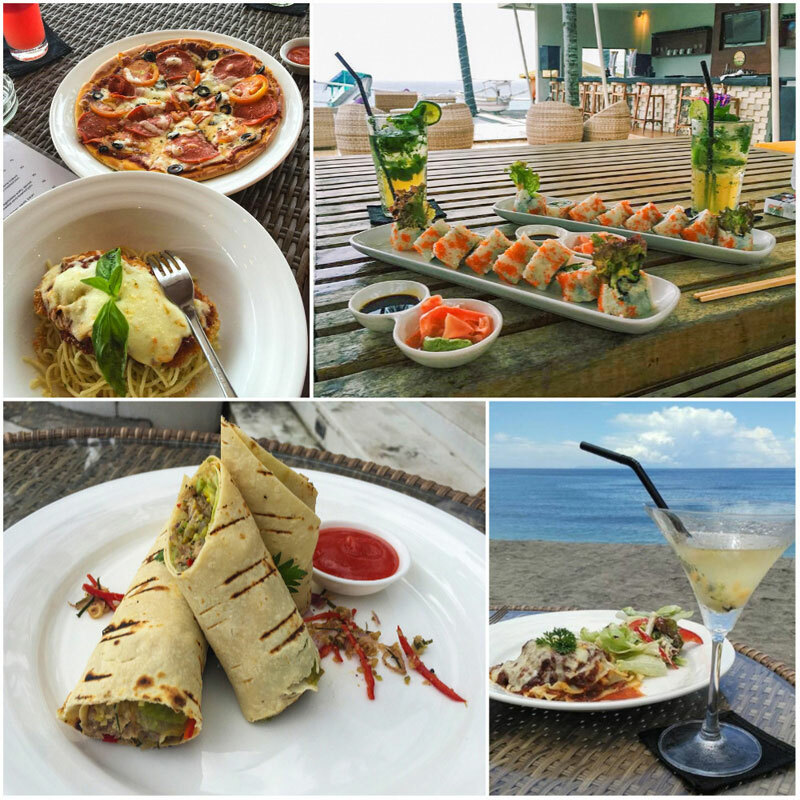 From mouthwatering options like grilled garlic prawns, rage rajang (Lombok-style fish in a yellow sauce) or simple fish of the day, these ocean-fresh options will make you glad you stopped here for dinner! Also available are some vegetarian and gluten-free options, as well as kids meals. And for sweet treats, try the homemade rum-and-raisin ice-cream – delicious! They can even organise a bonfire on the beach for you and your friends! 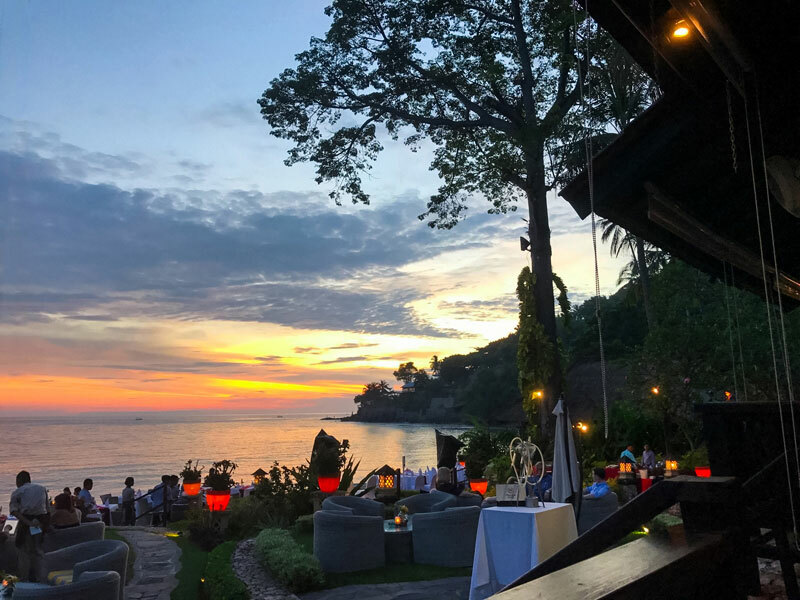 Editor’s Note: Laut Biru Bar has a dress code, so be sure to wear a sarong or T-shirt to cover your bathing suit when you enter the restaurant. 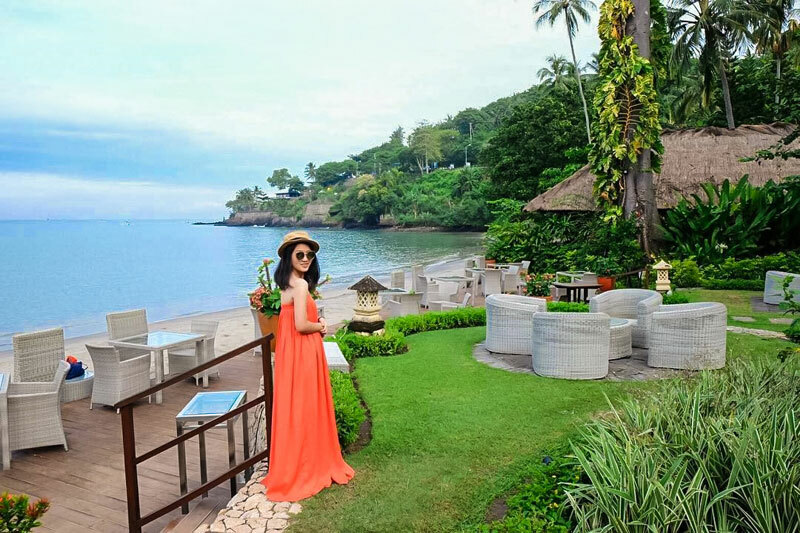 Lush palm trees, bright orange umbrellas, the wonderful Senggigi beach and delicious meals from all over the world – this is the tropical ambience that awaits you at Verve Beach Club & Restaurant. 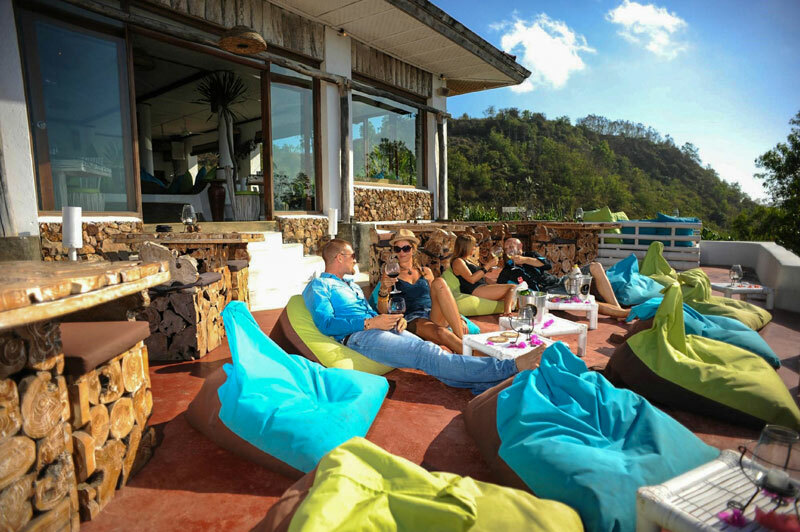 This vibrant lounge area is open concept and airy, where you can enjoy the laidback vibes of this beach club. Giant sushi rolls, gourmet pizzas, New Zealand lamb chops….how can you make up your mind? Warm chocolate lava cake served with ice-cream is also one of the tantalizing dessert options (or dinner, if you feel like having dessert first!). 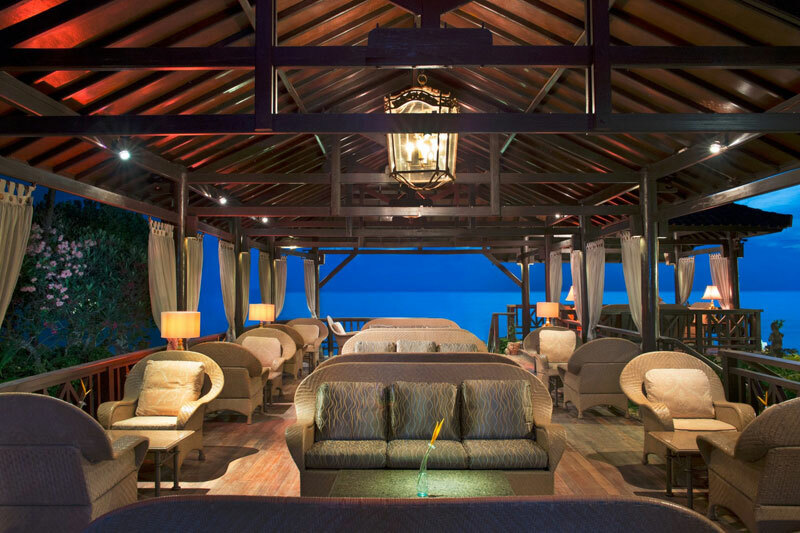 After dinner, get comfy in a sunbed, beach sofa or gazebo and enjoy the sunset with a cocktail in hand. Good news, ladies – every Wednesday, you get a free cocktail! Getting a little warm? 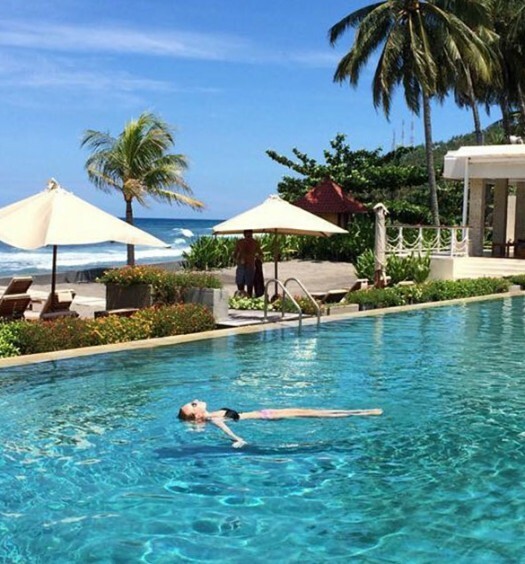 Take the plunge and jump into the swimming pool! 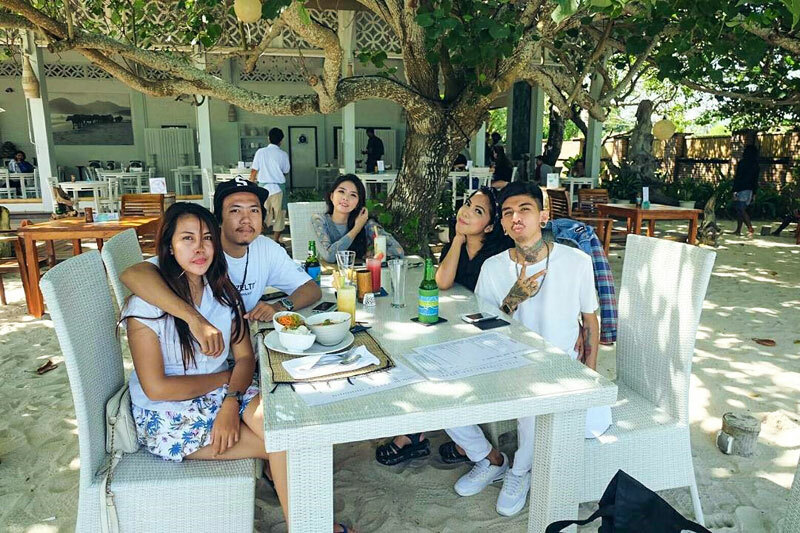 When did Lombok become Rome? 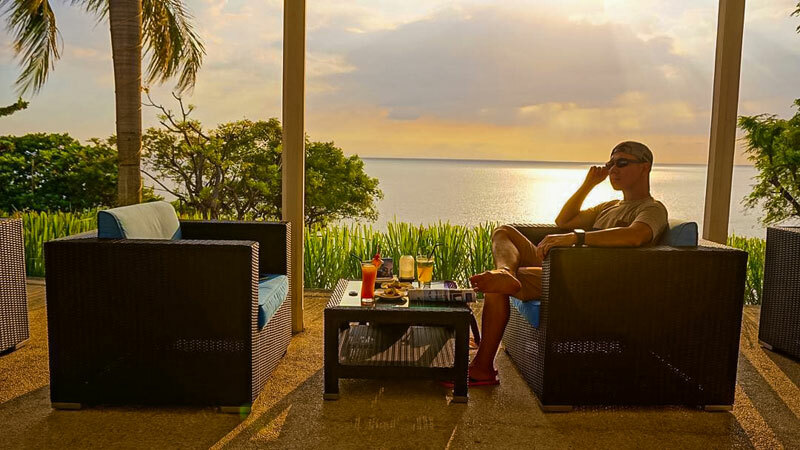 At Lotus Bayview, you might even forget you’re in Indonesia! 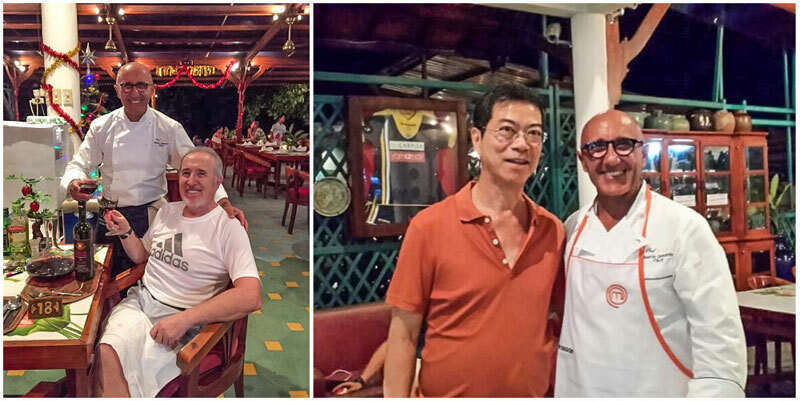 This beachfront restaurant is helmed by Italian chef Maurizio Cammarota, making it a very popular location for European travellers and anyone who loves Italian cuisine. You can find classic Italian dishes to satisfy your cravings, like margherita pizza, pasta, or the always-classic insalata caprese. Everything is made from the freshest ingredients and with flavours so rich and succulent, you’ll think you’re on the Italian coast. 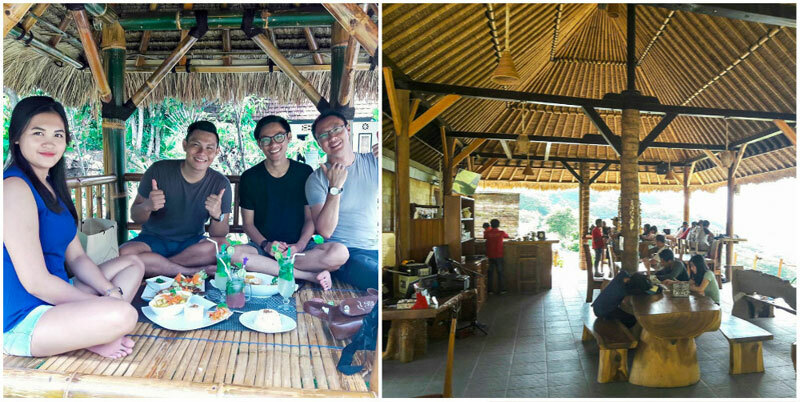 For those who prefer Indonesian cuisine, don’t worry! There’s plenty of regional dishes offered here as well. 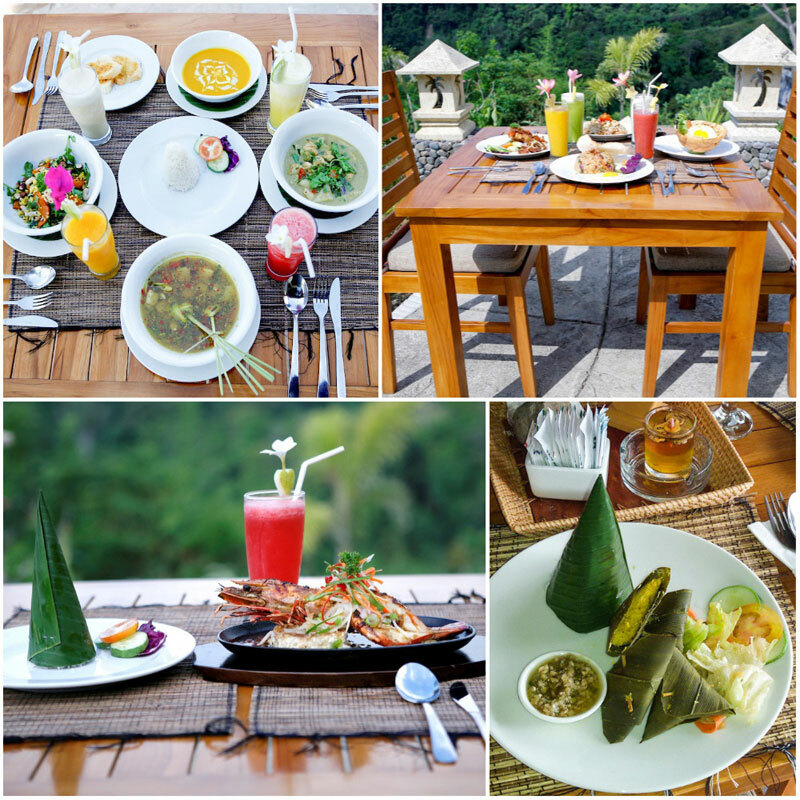 From Ayam Betutu, Jimbaran style grilled fish, or the typical Lombok dish Pelecing Kangkung (spicy water spinach), there’s something for everyone here. 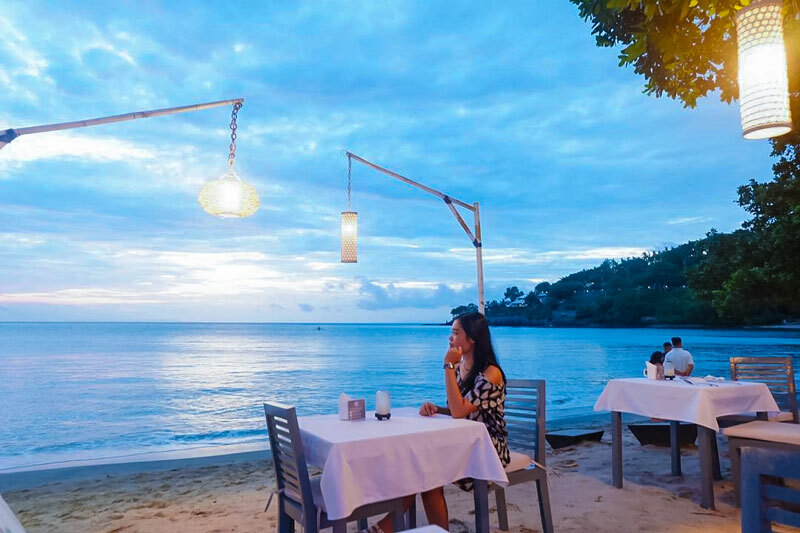 You can dine indoors for a cosy meal, or sit at a table outside and enjoy the soft white sand beneath your feet. 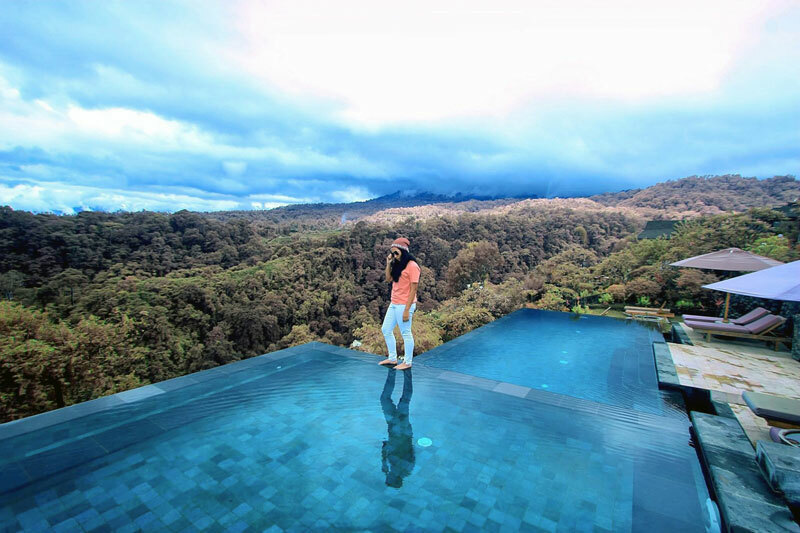 The view is just stunning – if it’s sunny and clear, scan the horizon for the majestic Gunung Agung in the distance. 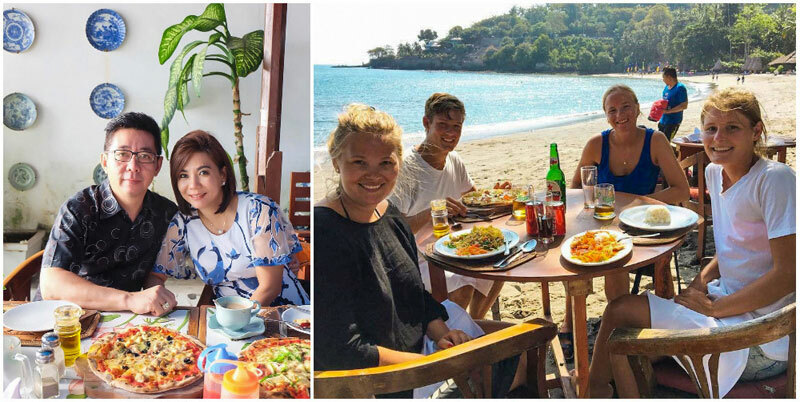 Imagine taking the best national meals from a selection of countries, two well-travelled professional chefs, a stunning ocean view, a stylish modern interior, and rolling them all up together into one restaurant. Well, it’s been done! 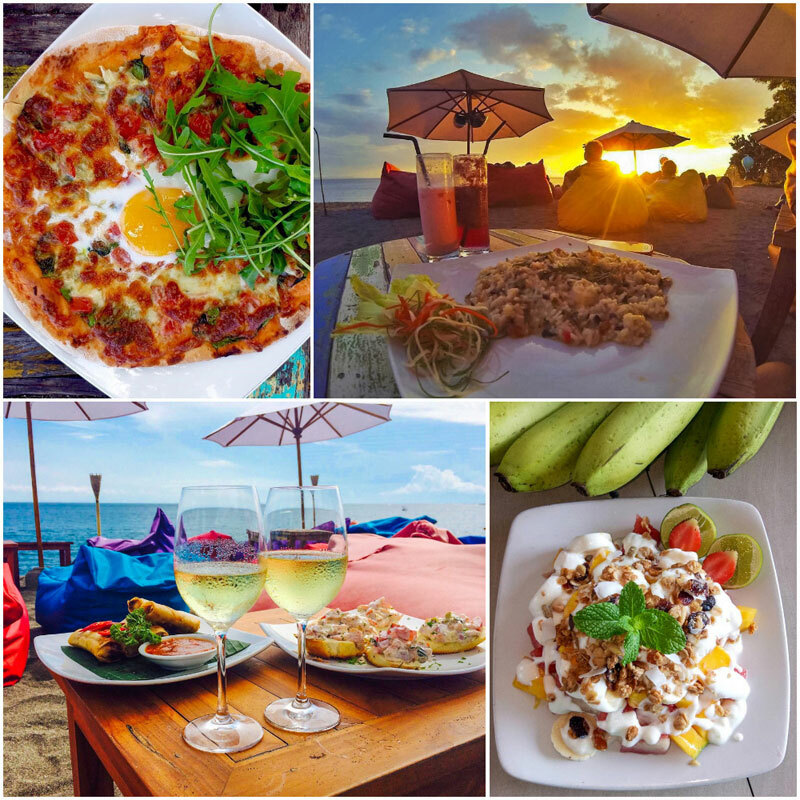 Welcome to Spice Lounge and Restaurant, an oceanfront restaurant where local herbs and spices are used to create wonderful combinations of international cuisines! Spicy Chicken Wings from Thailand, Mauritian Fish Vindaye, Kerala Style Chicken Curry from India or Khachapuri from Georgia. 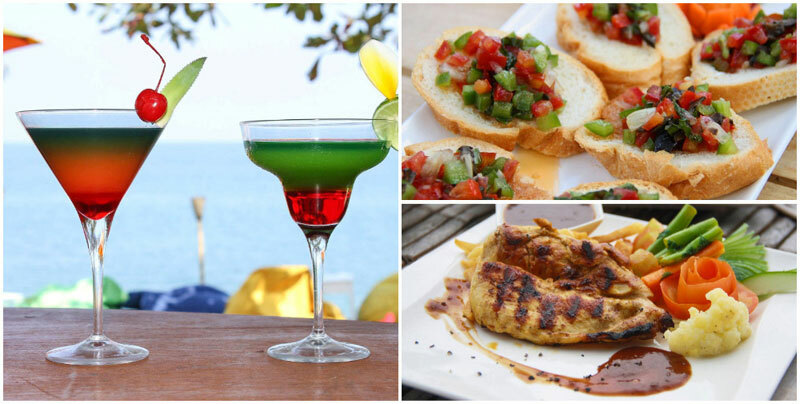 These are just a few of the menu highlights! If you’re feeling creative, you can also make your own pizza by combining three items from the menu. For dessert lovers, you’ll definitely want to sample the warm coconut tart with freshly grated coconut slices. Delightful! 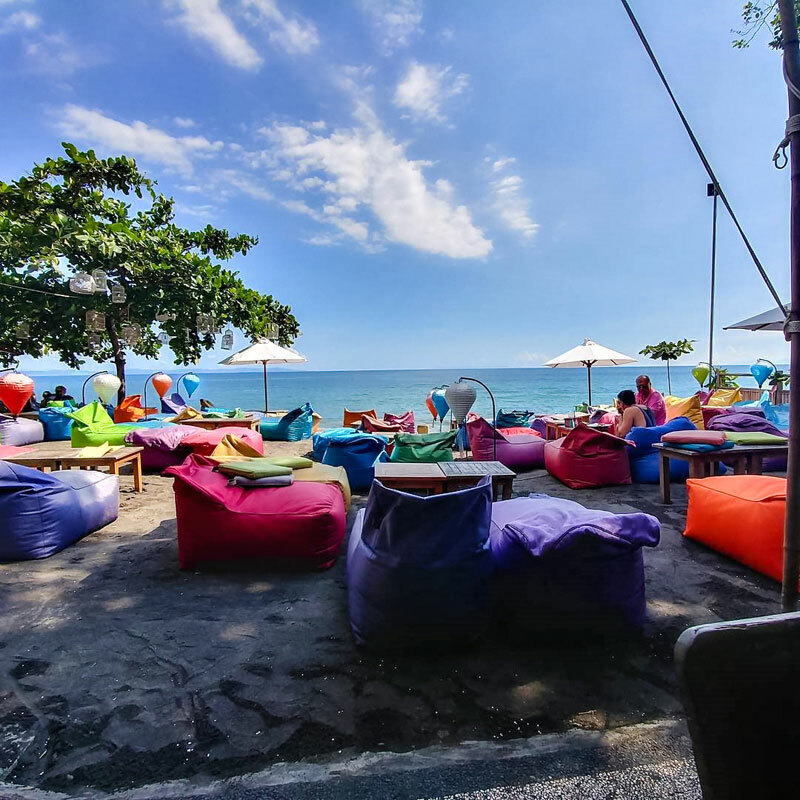 La Chill Bar has everything you might need to just switch off and relax – colourful beanbags facing the ocean, lampions, shishas and plenty of alcoholic beverages such as fresh, spicy sangria or a cool Bintang beer. 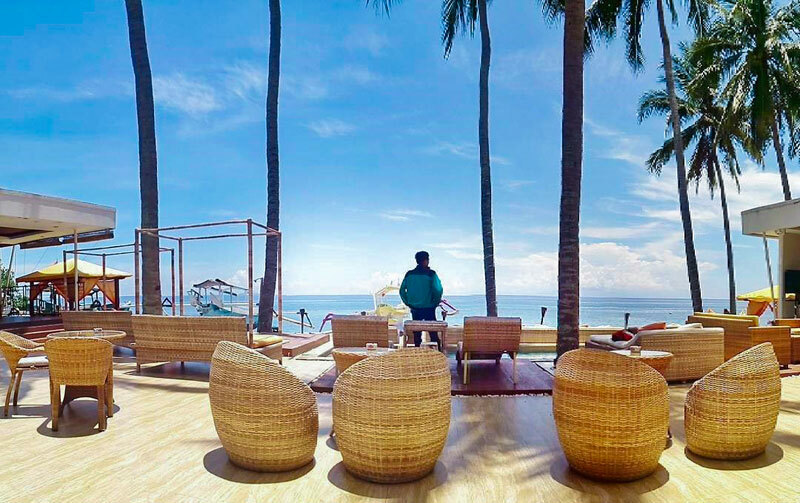 The beach-lounge vibes make this a perfect spot – watch the sunset over the ocean or simply lay back and close your eyes and listen to the waves against the shores. 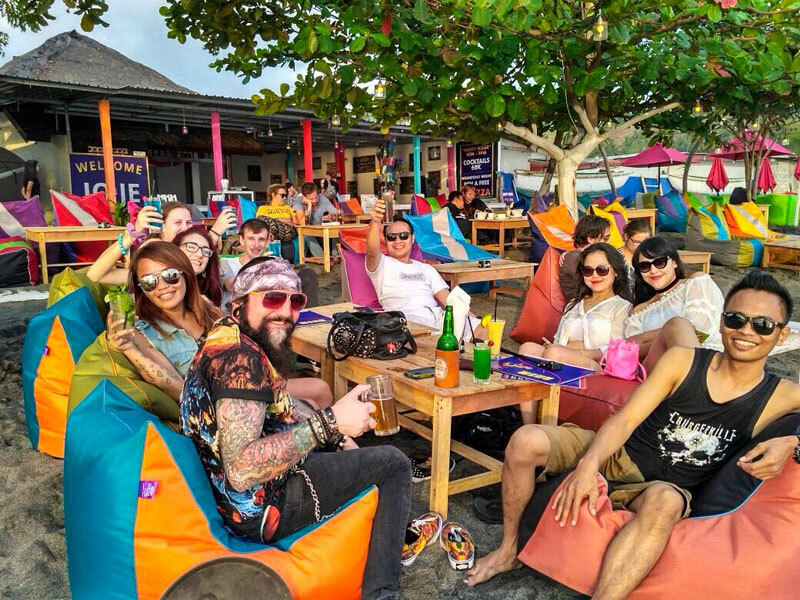 At La Chill, Cosmopolitans are so yesterday! Try a Cosmoshinta instead! This drink is concocted from black grapes, fresh lime, triple sec and vodka, for a fruity and refreshing end to your night. The Espresso Martini is another wonderfully original drink on the menu. Mixed fruit and vegetable juices are also options for those who like to keep things simple and healthy! Hungry? Their burgers are the best! If you don’t feel like having a full meal, some great snack choices include the grilled chicken baguette or amazing smoothie bowls (Rinjani Lawa is our favorite!). What are you waiting for? 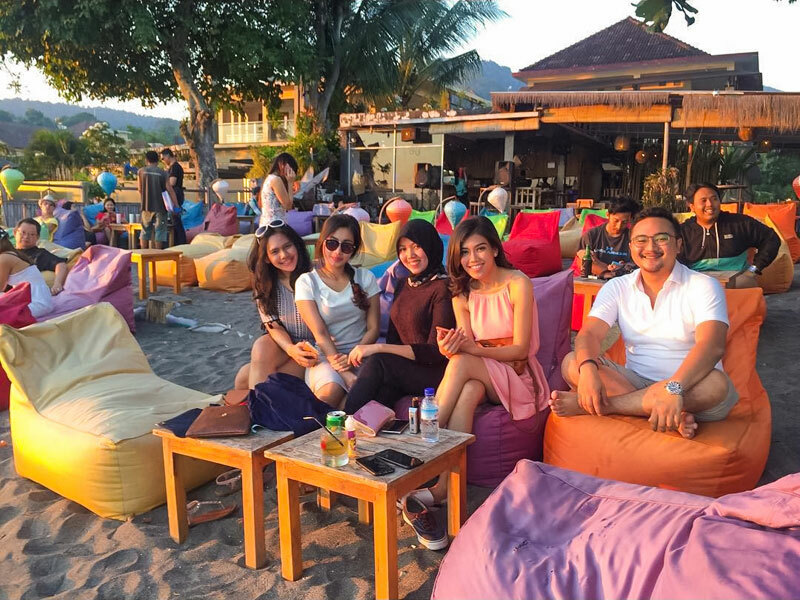 Grab some friends and head down to La Chill Bar for a relaxing evening on the beach! 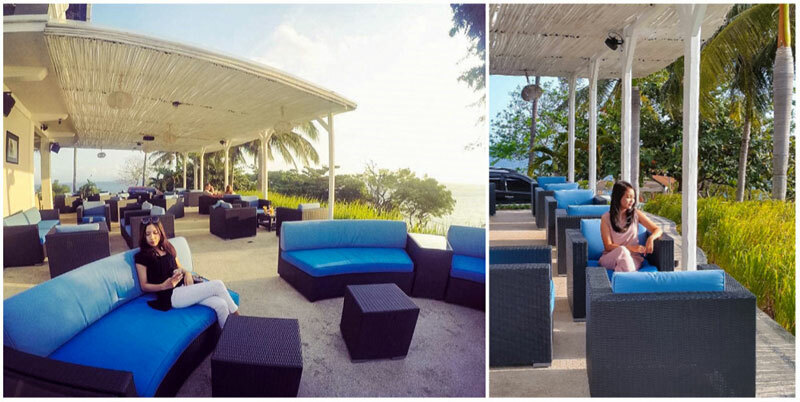 If you happen to be at La Chill Bar, it’s easy to bar-hop over to Jo-Je Beach Bar, which is located right next door! 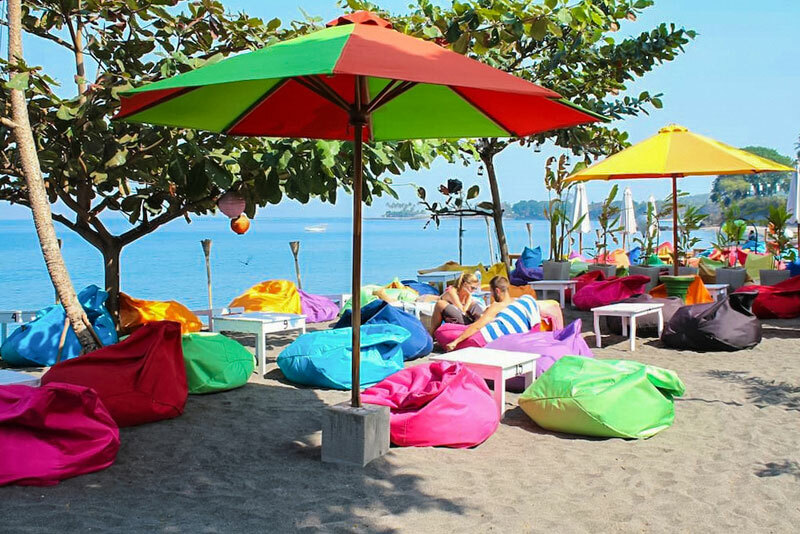 This colourful and bright little bar is located in the heart of Senggigi Beach, with funky beanbags spread out on the warm white sand. 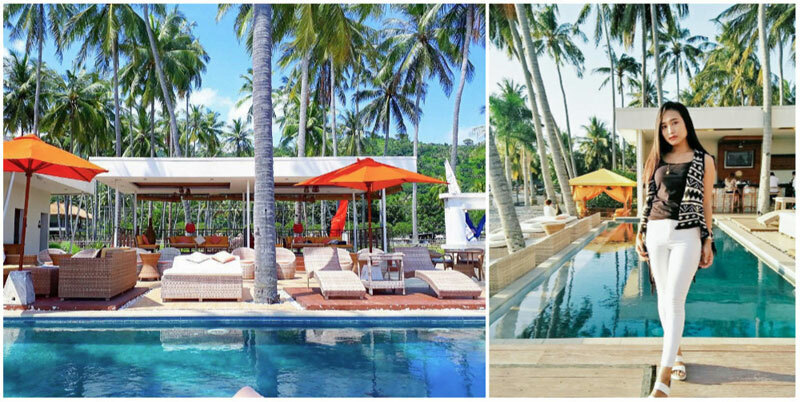 This is the perfect little daytime or evening getaway to sneak in a few cocktails! And cocktails are not all you can get here – there’s also a full kitchen hidden in the bungalow. Hungry? 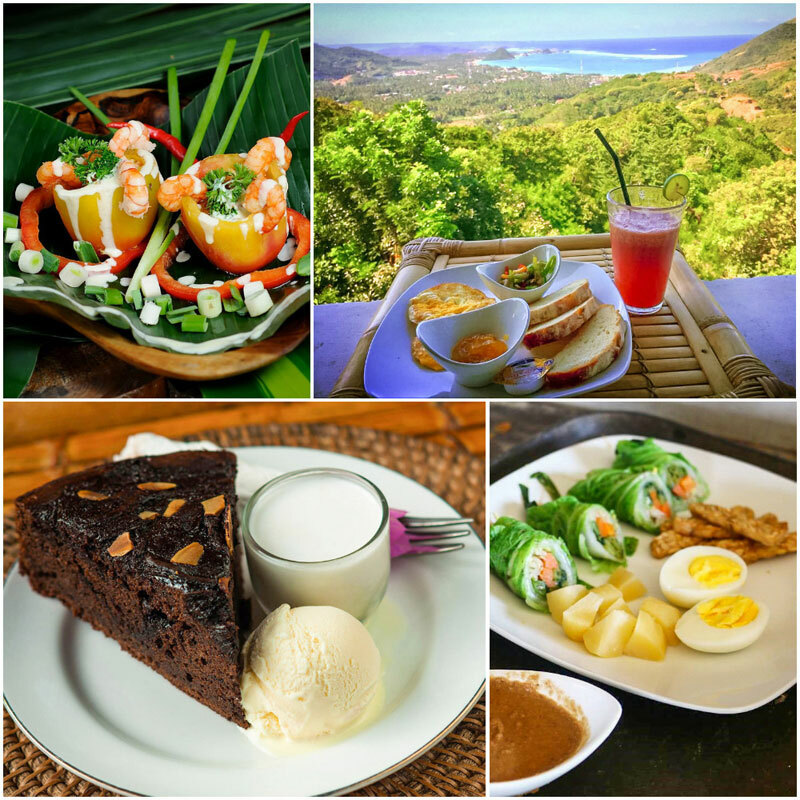 There’s a wide range of both Western and Indonesian options, to satisfy pretty much any kind of food cravings you might have! JoJe is best visited around dinnertime – after all, you’ll want to take advantage of their Happy Hour (half-priced cocktails from 4 to 9pm)! 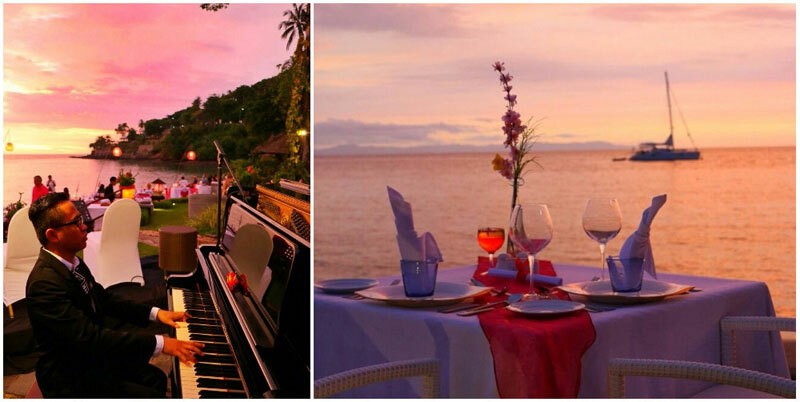 Know of any more places where you can dine in style with great views? Comment and let us know!